Still no word on whether the Resident Evil 2 remake could ever make its way to Switch, but Capcom will help Nintendo fans revisit the series' history another way this year. The publisher revealed on Twitter that it plans to release Switch ports of the Resident Evil remake, Resident Evil Zero, and Resident Evil 4 all on May 21. It's a lovely homecoming since all three games initially came out on GameCube, Nintendo's original handheld home console. Handheld in the sense that it has a handle on the back, I mean. All three games will be available on the eShop simultaneously, and US customers will also be able to pick up Resident Evil Zero and the Resident Evil remake in a retail bundle. Zero's a direct prequel to the original Resident Evil and they both use the same fixed camera angles and puzzle-focused challenges, so it makes sense to package them together. Meanwhile, Resident Evil 4 stands apart as an all-time great action game complete with suspense, scares, and cultist-crushing wrestling moves (and some cheesy quick-time events, but nobody's perfect). RE4's also gotta be real high up on the list of "Most Ported Games That Aren't Tetris" by now, so a Switch re-release is not at all surprising. 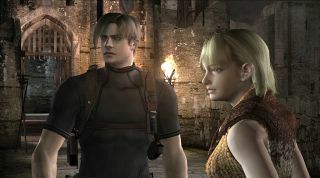 Resident Evil 4 also stars Leon S. Kennedy (who went from rookie cop to ace Secret Service agent in the space of six years) so it may be the closest thing you'll get to playing the Resident Evil 2 remake on Switch for the time being. Find more lurching horrors to confront in our list of the best zombie games.